Gunner is a horse who definitely lives up to his regal title; he carries himself with a nonchalant, dignified air, making his knightly title of "Sir" very accurate. 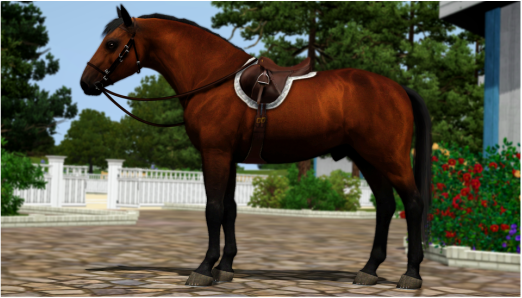 Although he can sometimes be an aloof stallion, he's never once been known to be mean, and has been a trusted mount for children attending riding classes at Wrenegade on more than one occasion. In particular, he's often the go-to jumping horse for the Akebe family's daughter, Aiko, although usually only when Sato isn't looking, as Dimitri's usual response is a shrug and a cautionary "don't die." Thus far, Gunnery has given them no reason to worry that rule would not be followed.